WASHINGTON — A coalition of the nation's biggest progressive grassroots organizations is activating a nationwide protest plan in response to Attorney General William Barr's expected failure to meet an April 2 deadline set by House Democrats to release Special Counsel Robert Mueller's full Russia report to Congress. With hundreds of locations set across the country, Stand Up America, MoveOn.org, Indivisible and Public Citizen are among the groups orchestrating the April 4 "Nationwide Day of Action," according to a release provided to NBC News. The plan marks a shift in strategy for the coalition, which had for months been organizing a protest plan in anticipation that the Mueller report might not be released to the public at all. 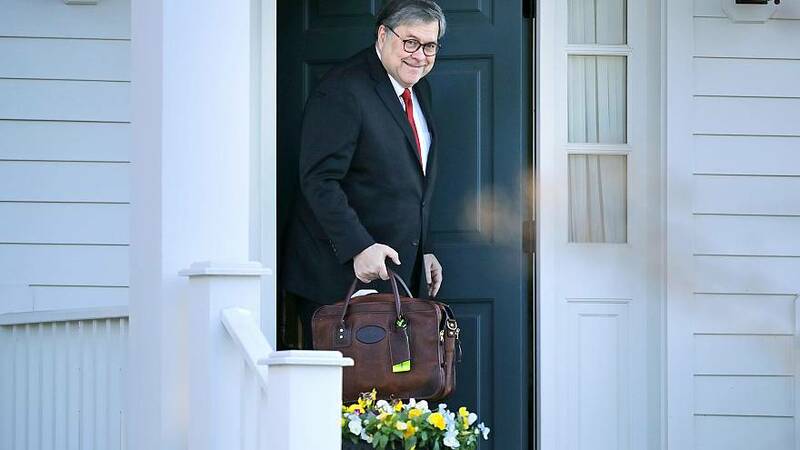 After initially summarizing Mueller's work in a 4-page document sent to Congress on March 24, Barr has said he'll release a more substantive version of the report by mid-April. But the attorney general has indicated he will make several redactions, including classified information Congress has said it needs to see. Barr also would not commit to obtaining court approval to give to Congress grand jury-related materials, according to House Judiciary Committee Chair Jerrold Nadler. Now, the coalition's focus is forcing transparency around one of the most politically sensitive documents in modern American history. "Barr has not committed to releasing the full report and underlying evidence," the coalition said in its statement. Further, the group said, Barr has given himself "the leeway to redact huge portions of the findings from Congress and the American people." It's unclear how many people will actually turn out at the protests, but thousands have RSVP'd online to attend to TrumpIsNotAboveTheLaw.org, including more than 16,000 who signed up to protest outside the White House. The protest plan has been activated once before: in November, after Trump fired former Attorney General Jeff Sessions. The day after the firing, protests were held in New York, Washington and Cincinnati, among other places, with protesters demanding that Matthew Whitaker, who took over as acting Attorney General recuse himself from the Mueller probe. This week's protests are also intended to raise public awareness about more critical information in the full, 400-page report at a time when many Americans appear confused about its contents. Nadler has scheduled votes on Wednesday for several subpoenas, including the entire Mueller report and underlying documents, as well as five Trump advisers who may have critical information and underlying documents. Barr's 4-page summary stated that the special counsel investigation did not find evidence the Trump campaign had conspired or coordinated with the Russian government. Separately, he ruled Trump had not engaged in obstruction of justice in the investigation. Notably, however, Barr said that while Mueller's report "did not draw a conclusion" about whether Trump had obstructed justice, "it also does not exonerate him." Democrats have other questions, including whether the report contains additional examples of Russian attempts to reach out to the 2016 Trump campaign that were not reported to the FBI; the Trump organization's financial ties to Russia, including a Trump Tower Moscow that Trump lied about during the campaign and whether Trump sought to reward Russia for its interference in the 2016 election by seeking to lift sanctions early in his presidency.